This episode is little late because I just got back from a week vacation to a part of the country where Cell Phones, Computers, and Internet were not a part of everyday life. Traci and I just spent a week in Greenville, Maine near Moosehead Lake (that's in Northern Maine). Out here, we hiked, slept, and ate and just had one of the most relaxing vacations ever. The people were AMAZINGLY friendly, the weather reached highs of only 75, and every day we saw at least one Moose. Actually, we saw 23 moose, 8 loons, 1 bear, 1 beaver, dozens of deer, chipmunks, and red squirrels, and enough birds to keep a birder glued to their binoculars the entire time. Best part of all, it was CHEAP. But this isn’t a podcast about Maine, it’s about Walt Disney World, so if you’d like to know more about our trip to Maine, and maybe want to vacation there yourself, email me and I’ll send you some information and links to help get you started. Now back to the show. 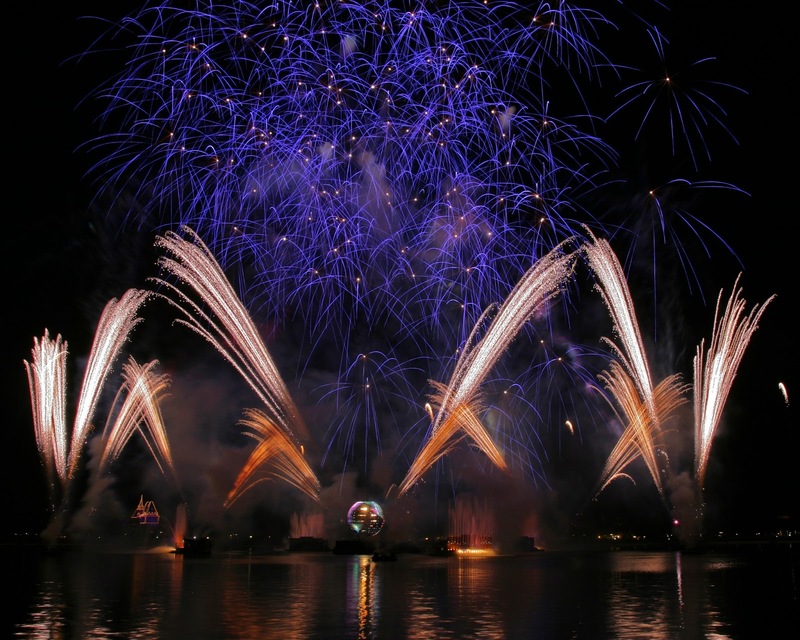 So today’s audio was recorded back in the spring of 2006, when I was traveling to Orlando for work, and was able to spend my evenings much like this one in the parks, and ending with the fireworks. We’ll start off by staking out a spot near the pathway to Future World, where the crowds tend to gather. The pulsing beat dies down, and the narrator welcomes you. He blows out the torches all around the lagoon and it starts. The drums beat… beat… faster… faster… building all the time till ‘POP’ a shot is fired from 2 locations in the lagoon, and as they ark their way towards the center you know something is about to happen. Then Bam! The fireworks really get going. After a few short bursts, you are introduced to the Inferno Barge, lighting the sky, and warming your face by burning liquid propane that is stored in tanks under the water, and piped through more than a mile of piping. After the first act, the music dies down, and out floats a 350,000 pound spinning globe, illuminated by 15,000 LED’s, all managed by 6 onboard computers. Then the music builds, the globe opens, and a torch appears. And as the singer says “We are one…” the torches of the countries relight, joining the globe almost stating in agreement that we are one world. Finally, the shots are fired from about everywhere, lighting up the sky in a spectacular display. I think this is where the majority of the 1,100 shells are launched… it’s just an amazing display, and then… it’s gone.